GenreOnline.net: Cartoon Network Announces All-New Television Series for the Global Phenomenon Ben 10! Cartoon Network’s fresh take on Ben 10will center upon a new animated series re-introducing the energetic, fun-loving, 10-year-old Ben Tennyson. At the core of the new Ben is a healthy serving of action, excitement, and all-around fun. Featuring many new and fan-favorite aliens, the series kicks off with the adventures of Ben, his cousin Gwen, and Grandpa Max as they travel the country during summer vacation. When Ben finds the mysterious Omnitrix, a world of alien superpowers opens up to him. Ben 10, the original precedent setting series, premiered on Cartoon Network in January 2006, to high ratings and an immediate admiration for the title character. Many boys and girls wanted to be a kid hero, just like Ben. The success of this series spawned three additional, original, animated series (Ben 10 Alien Force, Ben 10: Ultimate Alien, Ben 10: Omniverse), one animated movie (Ben 10: Secret of the Omnitrix), and two live-action movies (Ben 10: Race Against Time, Ben 10: Alien Swarm). 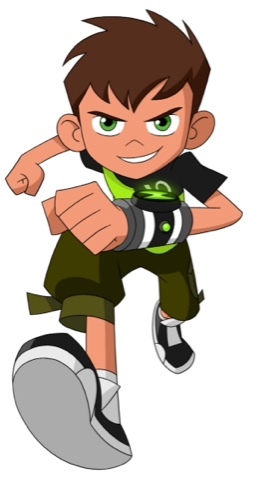 The adventure began when 10-year-old Ben Tennyson discovered a strange alien device, The Omnitrix, which locks itself onto his wrist and allows Ben to morph temporarily into one of 10 alien heroes. The powerful global franchise for Cartoon Network has been a proven sales success led by top-selling toy, interactive and home entertainment franchises generating more than $4.5 billion in global retail sales to date.